Is there any way of re-stocking with blue coloured catering first aid items such as bandages, eye-pads etc? We do sell all of the items in this kit, individually (apart from the saftey pins). Although, the only blue coloured items are the plasters. Eye pad dressing - Code 25607. Medium dressing - Code 17132. Large dressing - Code 24157. Triangular bandage - Code 75812. Blue detectable plasters - Code 11624. Alcohol free moist saline cleansing wipes - Code 11038. Blue Gloves - in Powder free vinyl (pack of 100) OR Powder free nitrile (pack of 200). Hope this helps! Specifically designed for those working in a catering environment, our Catering First Aid Kit provides adequate equipment for up to 10 people. 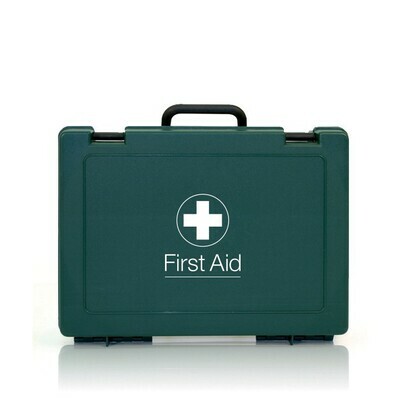 This BS EN 8599-1 compliant kit has been carefully devised by the British Healthcare Trade Association and contains a wide range of first aid products in quantities to suit all types of work environment. Covering all eventualities from a knife cut through to a potential hob burn, this kit can be mounted on the wall or stored away compactly for use when needed and gives peace of mind to all those working in potentially hazardous environments. An ideal choice for homes with larger kitchens, commercial catering environments or nurseries where cooking is part of the curriculum, ensure you have everything covered when embarking on any cooking project. Which size BS EN 8599-1 first aid kit do I need? The size you need depends on the number of employees you have and the nature of your workplace. We also have a wide range of additional BSI compliant First Aid Kits including those suitable for travel or for large groups of employees.